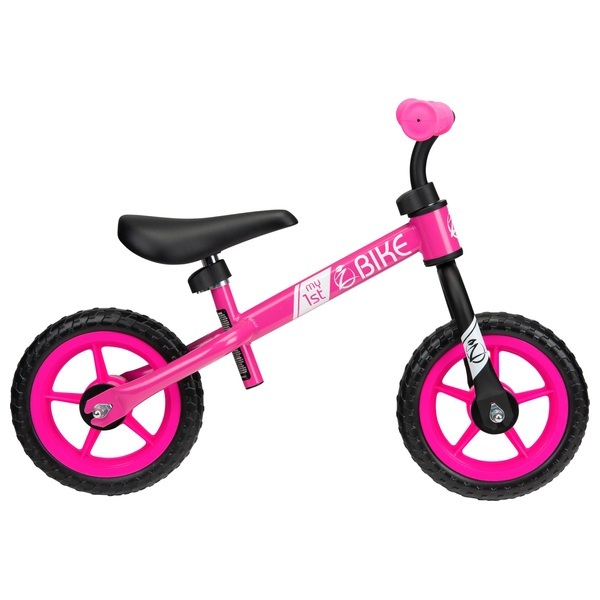 Zycom My 1st Bike Pink is full of great features to help your child set off on their first wheeled adventures! Zycom My 1st Bike has a super lightweight steel frame and 10 Inch EVA puncture proof treaded tyres seated on hardwearing plastic wheels. This provides a smooth ride and stability for your child whilst their confidence grows. To further develop your child's fine motor skills, the handle bars on Zycom My 1st Bike has a limited range of movement through 180 degrees. The 16.5 Inch wide handle bars with soft rubber comfort grips help perfectly balance the Zbike and feature large rubber bar ends to keep small hands securely in place. Both the handle bars and the seat are height adjustable with plastic guards to cover moving parts, perfect for growing children and a soft padded seat will provide comfort during the hours of fun that your child will have while learning to ride their Zycom My 1st Bike. EU Warning: Please remove all packaging and packaging attachments before giving this product to your child.